50-80% of new mothers experience the baby blues. One woman out of 5 experiences depression or anxiety during or after pregnancy. One woman out of 1,000 may have a serious condition - postpartum psychosis. One in 10 fathers experiences depression before or after the birth of their child. Postpartum Support International is dedicated to helping women suffering from perinatal mood and anxiety disorders, including postpartum depression, the most common complication of childbirth. Also offers free telephone support. Will call back within 24 hours (Press 1 for Spanish). Offers online, moderated discussion forums about perinatal mood and anxiety disorders. Text4baby is a free text messaging program for pregnant women and new moms. Moms can get FREE messages each week on your cell phone to help you through your pregnancy and your baby's first year. Text4baby is an educational program of the National Healthy Mothers, Healthy Babies Coalition. Referrals and authorizations to therapists who accept Medi-Cal, based on individual needs. Insurance review included, English speaking, Spanish (sometimes). 24 hour telephone counseling for individuals who are depressed or in crisis or are concerned about anyone who is depressed or in crisis. Helpline available 24 hours a day, 7 days a week for anyone experiencing depression during or after pregnancy, as well as for anyone concerned about a new mother. 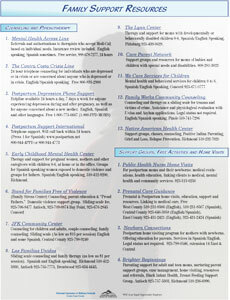 1-800-773-6667 (1-800-PPD-MOMS), English, Spanish and other languages. If you have feelings of sadness, stress or worry during pregnancy or after having a baby, you may have perinatal depression or anxiety. "Perinatal" refers to the time you are pregnant through the baby's first birthday. * If you have starred symptoms, you may have a serious condition called psychosis. This is an emergency. See a doctor right away. Sometimes family and friends notice your symptoms of depression before you do. Love and support can help but may not be enough. If the symptoms do not go away within 2 weeks, you should see a doctor or a counselor for treatment. When you get the right treatment, you will feel better. The Edinburgh screening tool (EPSD) was developed to screen for depression in pregnant and postpartum mothers. Take the EPSD online screening tool. The EPSD does not diagnose depression. Diagnosis can only be done by a licensed health care professional. This is normal and will go away in a few weeks after the birth of the baby. If the feelings do not go away after 2 weeks, or are severe, it may be perinatal depression or anxiety. Perinatal depression can occur during pregnancy or any time in the fi rst year after birth. It may not go away without treatment, which can include medication and/or counseling. With help you will feel better. It is normal to worry about your baby. But if you cannot relax, or the worry gets in the way of your enjoyment or connection with the baby or others, there is a problem. Some women with perinatal anxiety get racing or scary thoughts that are diffi cult to stop. If you are seeing or hearing things that others do not, you may have psychosis. Women with psychosis are often confused and not thinking clearly. Th is is an emergency. Women with psychosis need to go to their doctor or the emergency room immediately for evaluation and treatment. Fathers can feel the same overwhelming stress as mothers. They may need support and treatment to feel better. You are not to blame and it's not your fault. Being depressed or anxious while you are pregnant or a new mom may affect your baby and your family. Sometimes depression or anxiety makes it hard to interact with the baby. As a result, babies may cry more and children may have learning and behavioral problems as they get older. It is important to get the help you need to have a healthy, happy family. Talk with someone who supports you and understands how you feel. Talk with your doctor. He/She may refer you to a counselor. Your doctor will help you decide if medication would make you feel better.